Can You Tell an Anna's from a Rufous? 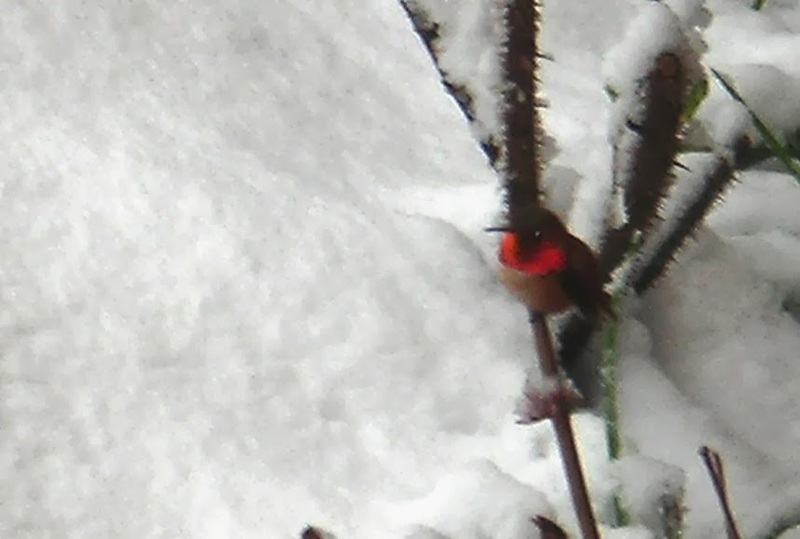 We have a pair of Anna’s hummingbirds in the yard this winter. 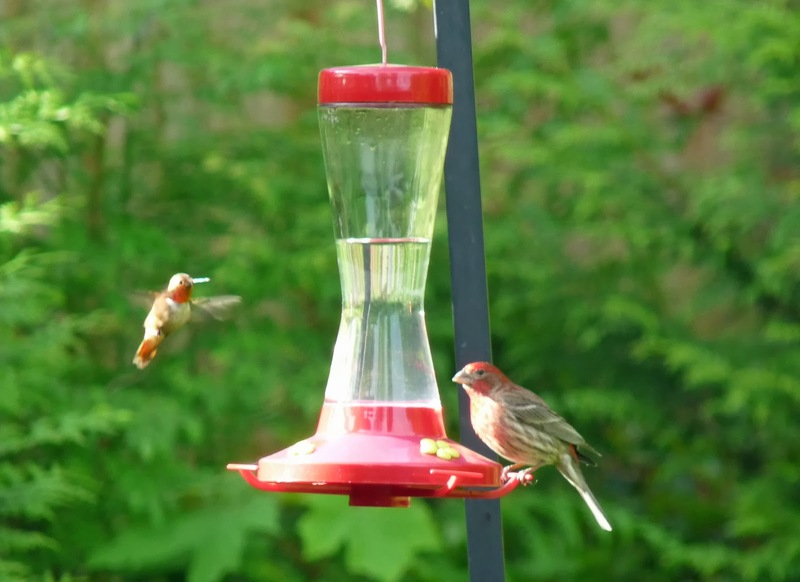 If you, too, have hummers right now, here on Gabriola Island, they’re also Anna’s, the beauties that Cornell’s All About Birds site describes as “more like flying jewelry than birds”. Male Anna's. Photo by Alan Vernon. 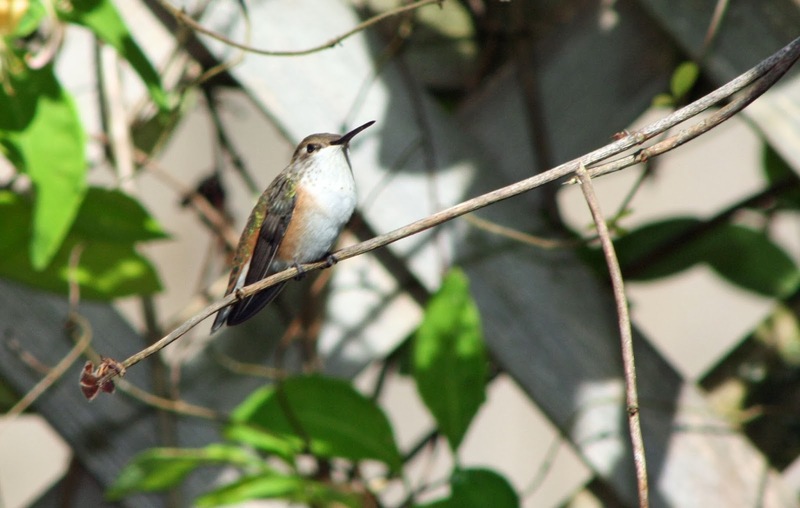 In the spring and summer, we have both Anna’s (Calypte anna) and Rufous hummingbirds (Selasphorus rufus) on Gabriola. You can tell them apart by their colouring. The sure-fire give-away is that the Anna’s has no rufous (orangey-brown) plumage anywhere, and has little white spots around the eyes. Once you know you’re looking at an Anna’s, you can readily distinguish male from female: the male’s red gorget, or throat patch, extends right over his head, making him a sparkling redhead when the sun shines on his iridescent hood. Striking emerald green plumage covers his back and bleeds onto his sides and white belly. The female, not as showy, is mostly emerald green and grey in colour with a small iridescent red gorget on the throat. The female Anna's has no rufous colouring anywhere. It does if you're a hummingbird facing down a House Finch! In the spring, the male Anna’s performs a wild and wonderful courtship display. From as high as forty metres, he does a nearly vertical dive downward, all the while eyeing the female. 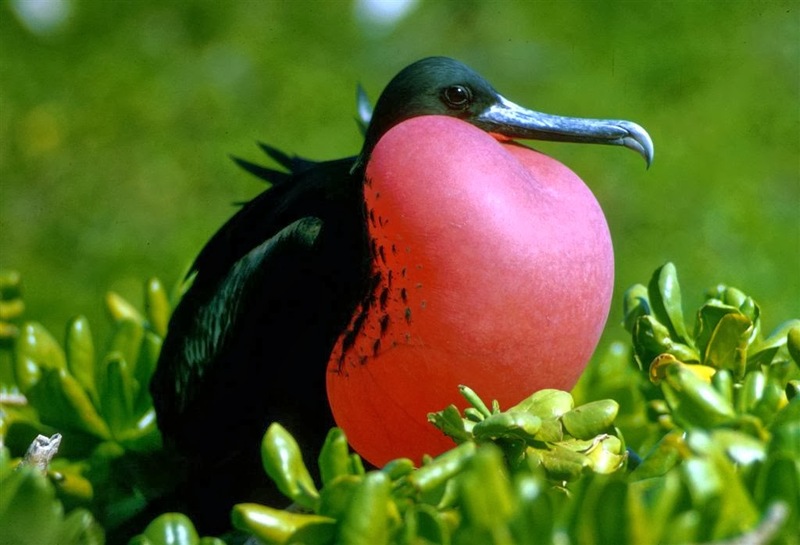 (On sunny days, he orients his body to take advantage of the sun reflecting on his iridescent throat and crown.) As he comes to a stop, he emits a short high-pitched explosive squeak (more on this later) then “chases” her (she has, by now, indicated her interest, somehow) while she leads him to her nest site. (Wiley little thing.) The female then perches and settles in to watch the show while the male does his “shuttle display”, swinging back and forth about half a metre above her, singing like crazy. All this lasts only about twelve seconds, does the trick, apparently. More now about that high-pitched squeak: until 2008 the source of this sound was a mystery. Then student researchers at the University of California used ultra-high-speed video cameras to film Anna’s in action, and discovered the squeak was made not by the hummer’s throat but by his tail feathers. (More here). In cold weather, though, all that matters to a hummer is staying alive. Not all do, of course. But if you have a feeder up, there are things you can do to help. Most importantly, keep the nectar from freezing. (What’s more heartbreaking than seeing an Anna’s sitting on the perch of a feeder with frozen nectar inside?) Some people (me included) have two or three feeders they rotate as needed, one in the house, staying warm, one outside, getting cold. When the outside feeder gets very cold (or freezes overnight) bring it in and replace it with the other one. Some people keep their feeders from freezing by placing homemade warmers, often concocted from light bulbs, just under the feeder. (I’d like to use my birdbath heater to keep the nectar from freezing but haven’t figured out how to do that yet.) Others wrap feeders in pipe insulation or beer mug insulators or even woolen socks. Many people use a sweeter than usual solution (3 sugar to 1 water) in winter because it doesn’t freeze as quickly as the 4-1 solution. 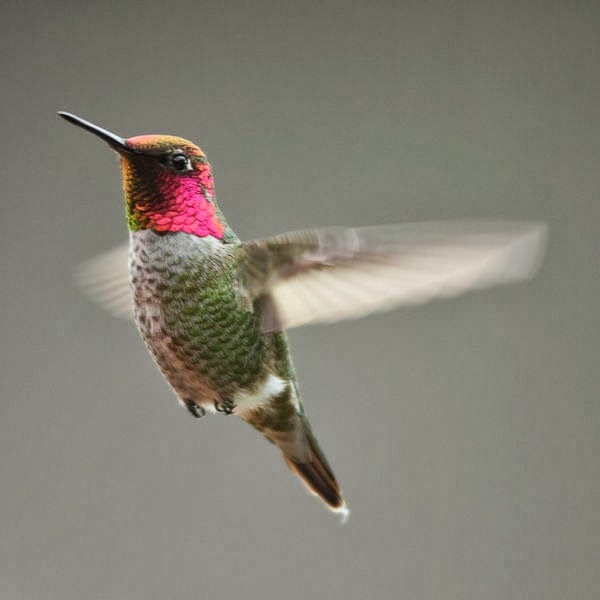 Whatever you do to keep the nectar from freezing, be sure to place your feeders a good distance apart so that the hummer has to fly (thereby creating body heat) to get to them. A version of this article was first published in The Flying Shingle on January 13 2014. When the last of the Rufous Hummingbirds headed back to Mexico in September, I missed them. So in November, when friends offered us two weeks in their eleventh floor condo overlooking Banderas Bay, the largest bay in the Mexican Pacific and habitat for approximately three hundred bird species, we said, of course, yes! Our flight path and circumstances were a little different from the hummers that left months before us. We flew WestJet, for example. During the five-hour flight food and beverage were supplied by friendly (and often funny) attendants with big smiles. The hummers didn’t have quite so cushy. 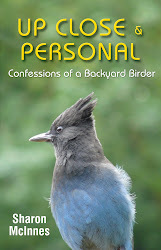 They made the three thousand kilometre trip from Gabriola to Mexico on their own volition, flapping those tiny wings over fifty times per second, through all kinds of wind and weather. As far as I could tell, all the WestJet passengers made it to Mexico well-fed and happy; sadly, only fifteen percent of the hummingbirds complete their migratory journey each year. The others die of starvation or exposure or by flying into communication towers. Some are nabbed by predators or trapped for the caged-bird trade. It’s not an easy life, being a migratory bird. Once ensconced in our delightfully warm home-away-from-home, I settled in to watch birds from the balcony. Some were species or sub-species of birds that visit BC during the spring and summer, including Snowy-bellied Martins (Progne dominicensis). Every morning I watched dozens of these graceful birds swooping the sky, greedily grabbing flying insects that might otherwise consider my bare arms breakfast. (Go Martins!) 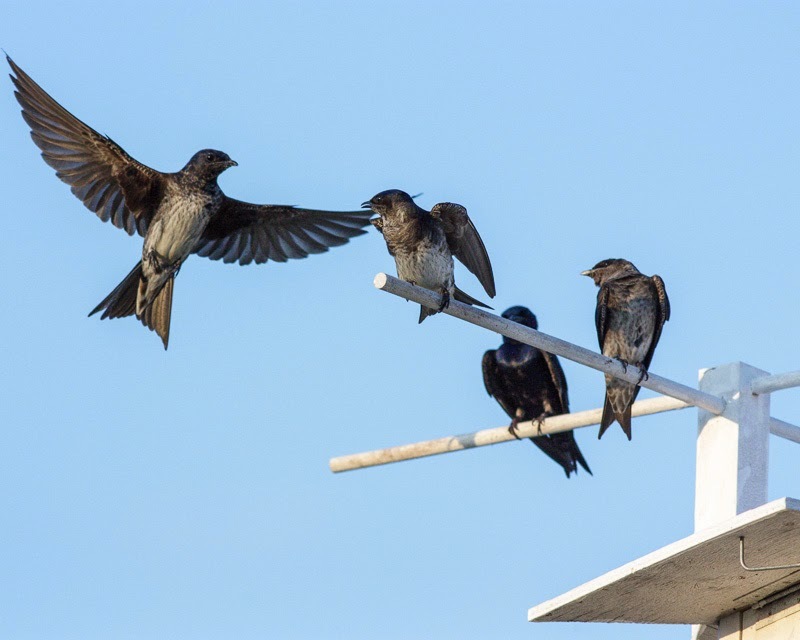 These martins are similar to the Purple Martins that live on Gabriola but have a broad white band along the breast and under their tail coverts. Purple Martins. Photo by Don Wigle. According to my Peterson field guide, Mexican Birds, it’s possible that Snowy-bellied Martins are actually a race of Purple Martin, kissin’ cousins, so to speak. 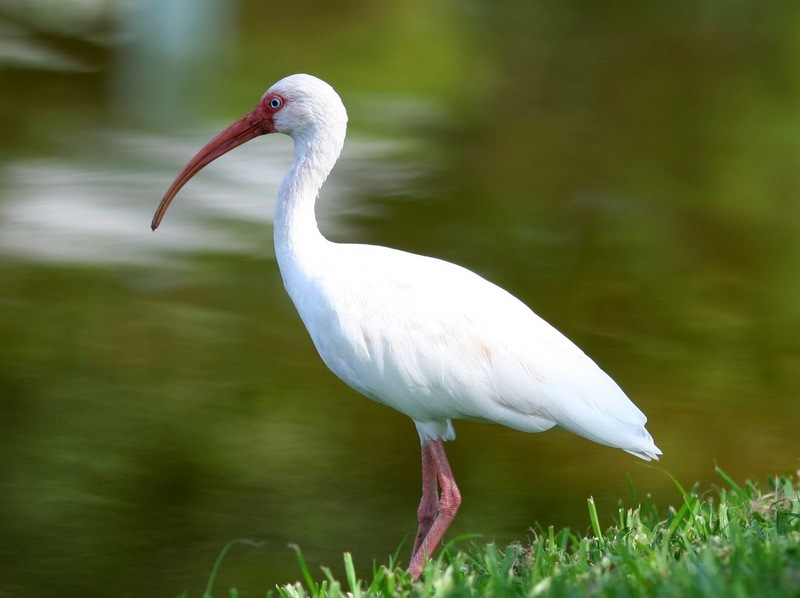 One morning I spotted a graceful Great White Ibis fishing in the shallow waters of the deserted beach next door. I didn't get a good photo but here's one of an Ibis by a real photographer! 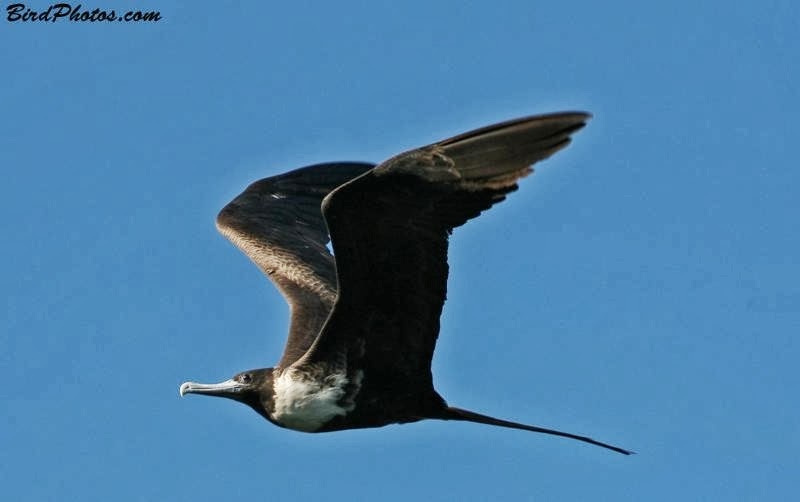 And every day, at all hours, long-winged, fork-tailed Magnificent Frigatebirds (Fregata magnificens) soared over the bay. One afternoon a small flock of green and yellow parakeets, possibly Guacamayas (aka Military Macaws) flew by. I waved, but didn't get a photo. 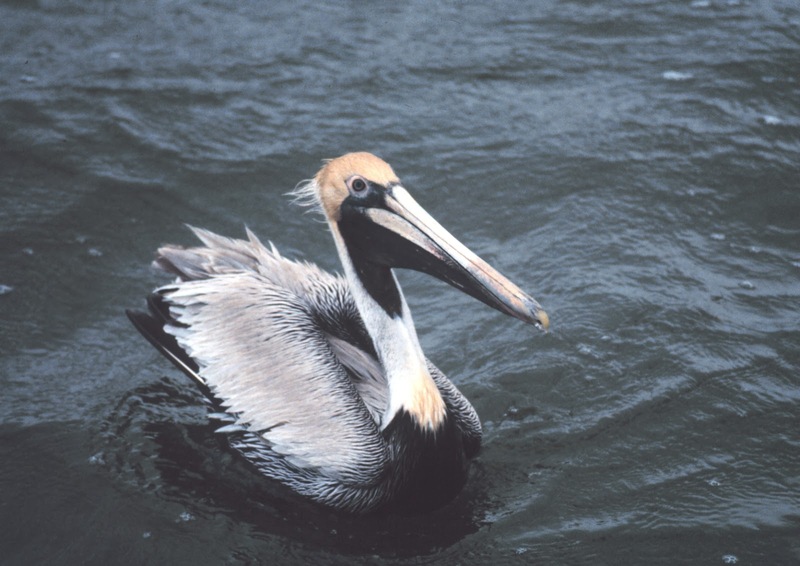 Then there were the huge ancient-looking Brown Pelicans! They flew past regularly, sometimes almost skimming the balcony rail, usually in synchronized squadrons of three or more. (Once I counted twenty-four flying in formation, reminding me of Canada Geese.) When feeling a little nippy, they’d plunge-dive straight down to the sea, stunning small fish that they’d then scoop into their throat pouches. These remarkable birds (Pelecanus occidentalis) were once on the brink of extinction due to pesticide pollution but have since recovered nicely. 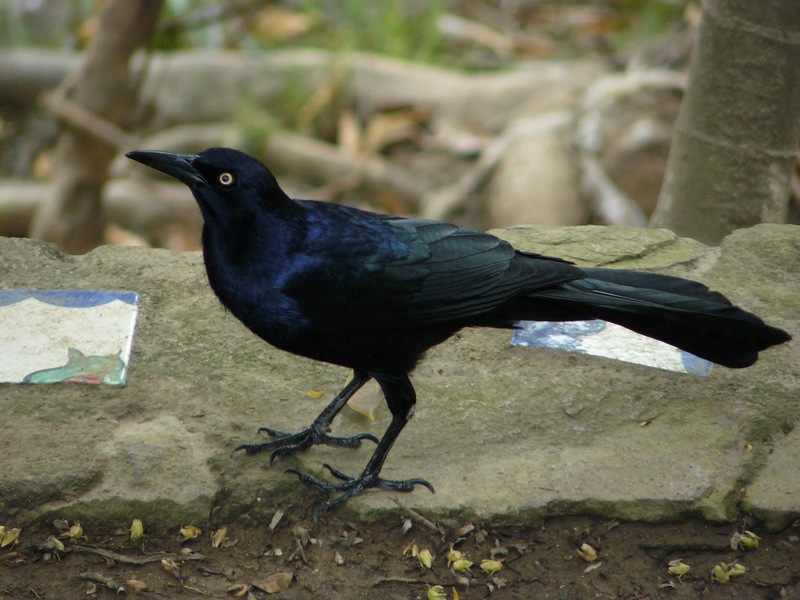 Although I resist having a “favourite” Mexican bird, I have to admit I adore the Great-tailed Grackle. This omnipresent, very social blackbird lives year round in much of the southern States and all through Central America. Like our crows, it’s considered a pest by farmers who grow grains and citrus fruits, especially when it shows up in a flock of tens of thousands! But to me, lolling in the Mexican sun, the Great-tailed Grackle (Quiscalus mexicanus) is fascinating. If you happen to be considering sneaking away to the sun this winter, (or if you're already there, as it seems half of Gabriola is right now) and you love birds, consider taking in The Vallarta Bird Festival from March 6-9, 2014. http://www.vallartabirdfestival.org/ I’ve done a little bird-watching in the Sierra Madre Mountains and highly recommend it. But one suggestion: pack super-duper mosquito spray! The Flying Shingle on December 16 2013.